had to do it in my language; a thank you in music. A sincere thank you and respect to Jay-Z and the Roc Boys. Take a listen, spread the word, and enjoy the music! Peace, DJ Neil Armstrong aka the All Out King"
Submitted by fuzzy4 on Thu, 03/04/2010 - 2:45pm. 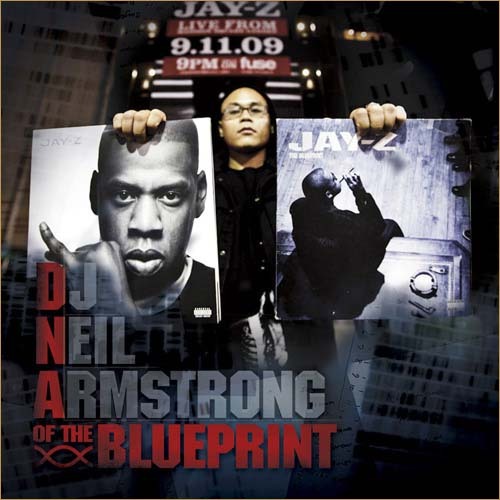 NEIL ARMSTRONG HAS TO BE ONE OF THE NICEST MIXTAPE DJ'S OUT. NO ONE HAS BETTER TAPES THEN HIM AND DJ RECTANGLE. ARMSTRONG TAPES IS ALWAYS A MUST DOWNLOAD. Submitted by SO_MUCH_CRACK on Fri, 03/05/2010 - 4:06am. Submitted by Peer Pressure on Fri, 03/05/2010 - 9:29am. Submitted by cam_miami on Sat, 03/06/2010 - 10:29am. Submitted by Yung Screw 817 on Sat, 03/06/2010 - 1:17pm. Do we really need another Jay-Z remix mixtape?? Hop off his nutz already all this songs are played out... PASS!! Submitted by cam_miami on Tue, 03/09/2010 - 4:56am.